If you are looking for a fun steam train ride in the Netherlands then the Stoomtram Hoorn-Medemblick route is for you. It combines a ride on a steam train with a boat ride that allows you to see much of the scenic countryside. The route offers amazing opportunities all year long. Even more exciting the route is covered by your Museumkaart! This steam train is confusing because it offers a combo experience with a steam boat, but I hope to give you enough information to feel comfortable booking this family adventure. 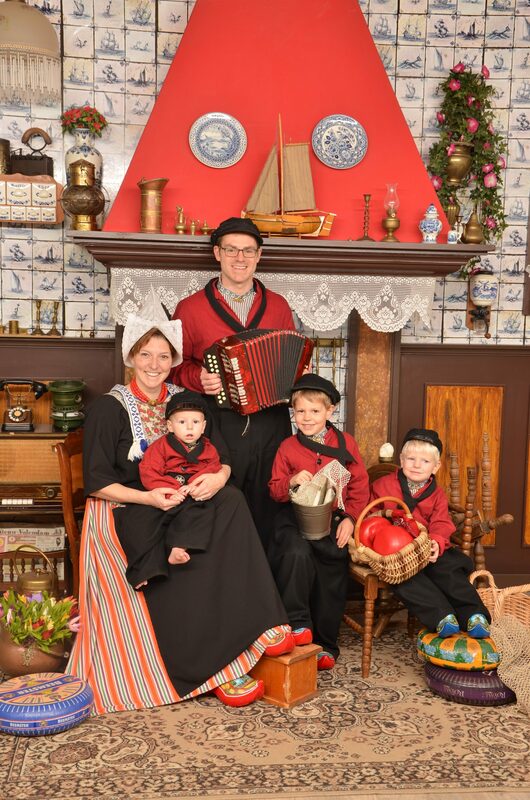 We opted to go out on one of the special theme days and booked our tickets for the Sinterklaas Train. Tickets should be booked in advance as the train often sells out. If you attend one of the theme days there is a small supplement fee if using your Museumkaart. You scan your ticket at the old fashioned ticket desk and head across the tracks to your platform to board the steam train. If you have a chance go up front and check out the steam engine! The boys loved that it was blue, just like Thomas. Our car was even decked out with special signs just for Sinterklaas. Each of the historic train cars is different. We walked through a few to find the perfect one for us. On the way there we chose open seats facing each other and on the way back we wanted a table. Each car has a place you can stand outside between the cars and watch the railway, which is really cool. We packed plenty of snacks to help the kids pass the time on the hour train ride. It is not that far of a ride but it’s a slow one. The train stops before each road crossing. Our foggy weather also meant we couldn’t see very much on the ride. The cars have bathrooms, which is perfect if you’re traveling with kids. The cars have heat, but because people were constantly coming in and out of the car it stayed rather cold inside. The Piets visited each car singing with the kids and taking time to chat with them. We were all treated to hot cocoa or lemonade and a cookie. When the snack car comes around you can also order poffertjes, but they are served on the return journey. Once you reach Medemblik you disembark the train and walk across the tracks to the steamboat. This is another great time to check out the engine. If you are not participating in a seasonal event, the boat trip takes you for an hour ride and drops you off where you take a regular NS train back to Hoorn. Our Sint boat ride was supposed to go out just for a big circle and back to the dock. Due to the fog we couldn’t leave the dock at all. The children didn’t care at all. They were treated to songs with Piet and then a visit by Sint. At the end each child received an age appropriate gift. The Middle Little got a set of linking blocks, which the kids played with the entire train ride home. The Big Little received a puzzle and the Little Little got a baby book. They were all thrilled with their gifts. We liked the gifts too because they were high-quality items. They weren’t junk. The Boat has catering facilities and on a typical trip this would be the prefect place to enjoy your packed lunch supplemented by some hot coffee and pie from the boat catering. We boarded the train for the ride back and enjoyed our packed lunch on the trip home. Many families around us got their poffertjes order near our arrival time back at the station. There is a small (one room) museum at the Hoorn station. We popped in to look at the photos, but it was crowded with one train disembarking and the other preparing to leave. The exhibits are in Dutch but the old photographs are worth looking at. We completed our Sint trip with a stop at one of the many Oliebollen stands around the country this time of year. This fried dough treat is one of our very favorites and the perfect way to end any holiday outing. We highly recommend this journey if you are visiting. In better weather I’m sure it affords stunning views of the Dutch countryside and a chance to take to the water.